High above the terraced green hills of Italy’s northwest coast, on a breezy ridge-top trail overlooking the Ligurian Sea, I rest for a minute to enjoy the sun and silence. Today is July 18, the very heart of the summer tourist season in southern Europe, and yet it seems I have Cinque Terre all to myself. I loosen my hiking boots and take it all in, happy to bake a little under the Mediterranean sun. Soon a hunched old man approaches, and I suspect he’s a local because I haven’t seen another tourist since breakfast. He must think I’ve been sitting here for a while—or maybe I just look content—because he stops, grins, and says something that sounds like il dolce far niente. I nod back, because my Italian is dreadful, and it’s not until I hear the phrase again a few days later that I understand. Il dolce far niente, “the sweetness of doing nothing,” is something of a motto in this part of Italy. The cliff-clinging fishing villages of Cinque Terre (literally, “the five lands”) have been around, in one form or another, since the Middle Ages, but it wasn’t until American guidebook mogul Rick Steves made them famous that the area became a certifiable tourist trap. Still, not even an army of tourists could diminish the chaotic charm of Riomaggiore and its jumble of sun-washed houses, all pinks and yellows and blues tumbling toward the sea; and nothing could spoil the sloping vineyards of Corniglia, the bustling trattorias of Monterosso, or the simple pleasure of following a centuries-old walking path along the rocky coast. There are loads of tourists, though, and that’s just a reality these days. But before you resign yourself to rubbing elbows with every sweaty vacationer and his brother—who may or may not be wearing a Speedo three sizes too small—consider this: There’s another side to Cinque Terre, and it’s one that very few tourists ever see. Most visitors find themselves hiking at least part of the Sentiero Azzuro (the “blue trail”) at some point during their stay. This pleasant eight-mile walking path has become a tourist thoroughfare despite its sometimes challenging terrain, largely because it’s billed as the most “authentic” way of traveling between the five villages. While the volume of tourists has chipped away at the trail’s natural charm, the bikini-and-sandals crowd usually steers clear of the most demanding stretch. Whereas the three-village walk from Riomaggiore to Manarola to Corniglia is relatively gentle—it’s even paved in some places—the remainder of the trail is very demanding and almost all up and down. After Corniglia the path heads slightly inland and its rewards become more subtle: There are more sun-drenched olive groves and terraced vineyards than wild coastal vistas here, but the payoffs come in the form of a heart-pumping vertical ramble and the relative peace and quiet between Corniglia and Monterosso. For complete solitude, though, head to Sentiero Rosso (the “red trail”), a ridge-top path that hovers several hundred meters above the five villages. At 25 miles long, Sentiero Rosso is about three times the length of the well-traveled blue trail, but when taken in stages it’s actually an easier, flatter walk. The full path runs east to west from Portovenere to Levanto, two towns that bookend the five official villages of Cinque Terre. You don’t have to walk the entire way, though, as there are steep access trails from each of the villages that allow you to make the walk as long or as short as you like. It’s on Sentiero Rosso that you’ll literally find yourself above the fray, with expansive views and few other tourists to spoil them. But beware: Next spring will see the arrival of a new cable car system to bring visitors from Riomaggiore to the higher terrain. The crowds are sure to follow. Cinque Terre National Park rents mountain bikes from the Montenero Sanctuary on the hill above Riomaggiore. The crisscrossing network of trails follows roughly the same route as the Sentiero Rosso, and leads you about as far from the tourist centers as you can get on two wheels. The terrain ranges in difficulty from easy to challenging (though “easy” is a subjective term). A full-day rental is just four euros with the Cinque Terre card. For something entirely different, rent a sea kayak and snorkel gear at the area’s only authorized diving center, the Coopsub Cinque Terre in Riomaggiore. Coopsub rents kayaks and also organizes trips for those who don’t want to go it alone. This is a great alternative to the hiking trails, especially in July and August when a quick dip in the water is a welcome relief from the summer sun. Kayak rentals are easy to come by at beaches up and down the coast. It’s only about a half hour’s paddle between each village within Cinque Terre—the whole area is only eight miles long—and there’s no better way to beat the crowds than completely leaving them behind on your watery commute from one town to the next. You can spend a more leisurely day on the water with either the Golfo Paradiso or Golfo dei Poeti ferry lines, which run between the Cinque Terre villages. Golfo Paradiso visits coastal towns up and down the Riviera di Levante, including Monterosso and Vernazza. Golfo dei Poeti offers local service to four of the five Cinque Terre villages. The nearest major international [[Airports | airport]] is Milan, about three hours by train from Cinque Terre. 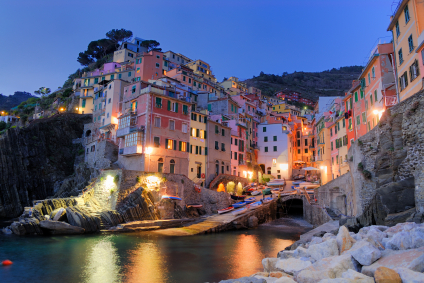 Purchase a three-day Cinque Terre card for 10 euros when you arrive on the coast. It covers unlimited local train rides between the five villages and gives you “free” access to the Sentiero Azzuro hiking trail. It costs three euros to hike the blue trail without the Cinque Terre card. Although Cinque Terre is now a year-round tourist destination, college students and backpackers of all ages descend in droves when July and August roll around. Both the crowds and weather are milder in May and September. It’s still hard to find a room even then, however. To avoid booking months in advance, go between November and March. I used Levanto as a base for my travels rather than fighting for a room in one of the five villages. While it lacks the slapdash charm of, say, Riomaggiore or Vernazza, this lively little beach town is still a great money-saver and a good place to find a bed even when Cinque Terre is bursting at the seams. Many of the nearby towns, in fact, evoke the region’s simple dolce vida charm without all of the tourist trappings. Head to the beach in nearby Bonassola, for example, and you’ll wonder why anyone is paying $12 to rent an umbrella at the overcrowded beaches of the “official” Cinque Terre towns. Then sample some fresh-baked focaccia, made with the same lemons you passed in the hills above town, and relax with a glass of Sciacchetrà, the local dessert wine. Only when you’re far from the maddening crowd can you really appreciate how sweet il dolce far niente can be.